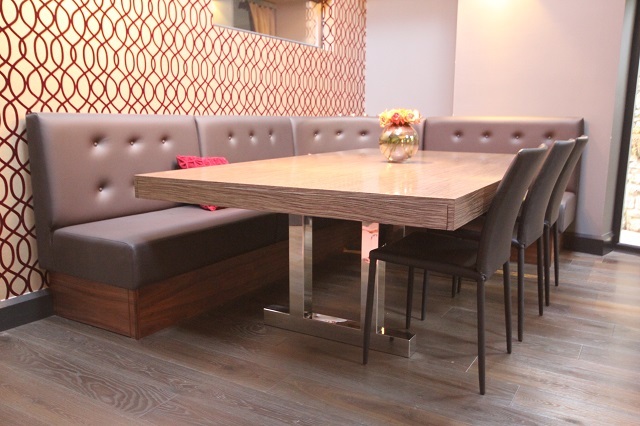 A stunning contemporary dining table with fantastic veneer and mirror polished chrome legs. The table includes a smooth operating extension mechanism. To help create the most convivial of environments the table is surrounded on 2 sides by sumptuous leather upholstered banquette seating with contemporary buttoned backs. “Paul Case Furniture was initially commissioned to make a bespoke extendible table for us, but our project progressed and Paul and his team produced more quality furniture for our new dinning area including a full wet bar, wine room, dresser and shelving.